In a rapidly changing landscape, if you’re still not using Search Engine Optimization to get your content to stand out, now is the time to do so or risk falling behind those who do. 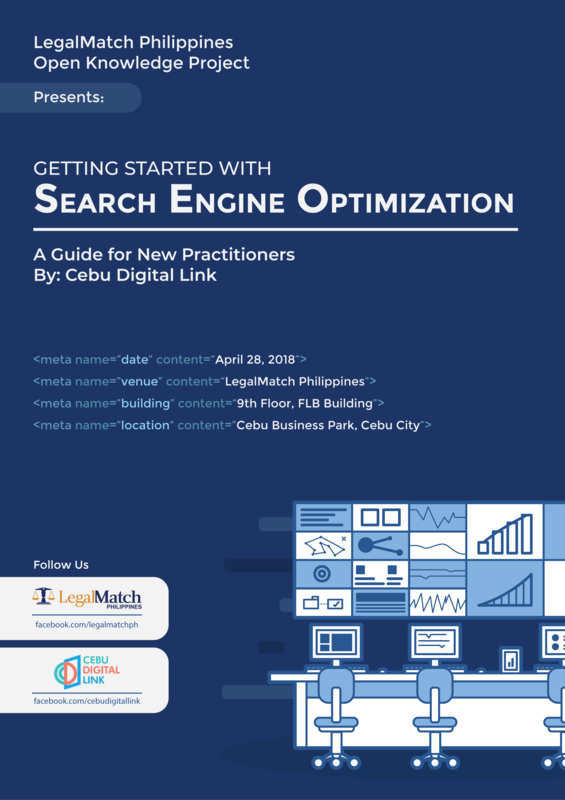 Legalmatch Philippines (LMPH), a pioneer in software applications for the US legal industry, is organizing the training workshop entitled “Getting Started With Search Engine Optimization – A Guide for New Practitioners”. This training workshop will be on April 28, 2018 from 8am-12 noon at the company’s office at the 9th floor of the FLB Building, Cebu Business Park. This activity is part of LegalMatch’s Open Knowledge Project – a program for organizing meetups and trainings covering various software development and online marketing topics. This is the second in a series of training initiatives planned for this year. The first was Agile Essentials which was successfully held last March 24, 2018 in collaboration with partner universities in Cebu. The “Getting Started With Search Engine Optimization” training workshop is organized by Legalmatch Philippines in partnership with Cebu Digital Link, a start-up organization providing SEO services to clients here and abroad. The founders were already doing SEO freelance services for more than 10 years prior to launching Cebu Digital Link late last year. The training will be headed by LegalMatch Philippines’ SEO Lead, Ian Lebumfacil, and Cebu Digital Link’s Jackquiline Doring, April Joy Canete and Cathy Trimidal. It will cover an Introduction to SEO, Link Building, SEO Content Writing, Technical SEO, and Website Analytics. It will also feature a hands-on and a Q & A session with participants. Trainees will be given certificates upon completion of the training. Be one step ahead in digital. Learn why SEO matters and start using SEO for your business or your content strategy. Interested to find out more or to learn of future trainings and tech meetups? Send us an email at happyteam@legalmatch.com or send a message at our Facebook page to reserve a slot. Watch out for LegalMatch Philippines’ upcoming events by following our Facebook page . You may also call us at +63(32)266-3021 or drop by our office on weekdays.